Madrid studio Ecosistema Urbano has won first place in a competition to revamp the waterfront of Florida’s West Palm Beach, with a proposal for domed spaces that house an array of functions, from an aquarium to a yoga and meditation zone. Called Open Shore, the scheme is the winner of the Shore to Core competition organised by New York think tank Van Alen Institute and the West Palm Beach Community Redevelopment Agency. The competition called for forward-thinking and flexible designs that would strengthen the connection between the city’s urban core and its waterfront, and would make the space a year-round destination. While the city is a popular vacation spot during the winter, it draws smaller crowds during other parts of the year due to rain, humidity and hurricanes. Ecosistema Urbano, a Madrid-based multidisciplinary studio, beat over 40 international teams with its proposal, which “envisions a healthier and more resilient downtown and waterfront for West Palm Beach”. The scheme incorporates an array of new public spaces and outdoor activities that increase opportunities to interact with the water. “This new urban environment blurs the line between the city and the water, bringing the nature of the Lagoon back to the city centre while adapting to rise of the sea level,” the team said. A key component of the design is a series of bioclimatic domes, which would provide comfortable spaces throughout the year. The structures – described as “the first bioclimatic domes in the US” – would enclose or cover a variety of spaces, dubbed plazas. Each would have a distinct function. The Cloud Forest Habitat Plaza would be adorned with hanging gardens, while the Aquarium Plaza would house local marine flora and fauna. The Mindfulness Plaza would accommodate yoga and meditation, and the Playscape Plaza would be a fun area for children and adults. The scheme also features plazas dedicated to sporting activities and the display of art in a forest-like setting, among other functions. The team has oriented the plazas so that they would allow for breezes to pass through to the urban core. Ecosistema Urbano also provides ideas for how to deal with an existing parking garage, which it has named the Banyan Hub. It envisions converting the structure into a mixed-use facility filled with plants and artwork. A green, permeable facade would be created, along with two large courtyards. Possible uses for the site include a farmers market, co-working spaces and skyline viewing platforms. The plan also calls for the creation of a great lawn and amphitheatre, along with the revamping of alleyways. “The project takes into consideration the needs of youth and elders alike in order to make a positive impact on the city as a whole and create a healthier living environment for all residents and visitors,” the team said. In addition to design concepts, the Shore to Core competition asked for research proposals that identified opportunities to create healthier and more inclusive cities. The winner, Happier by Design, focused on how tactile spaces can increase a sense of well-being, and conducted a pilot study analysing the health benefits of more complex and engaging urban landscapes. 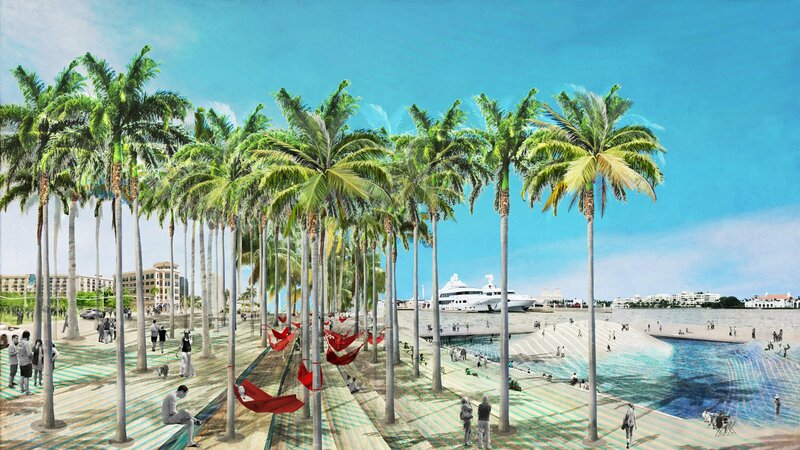 Other proposals for West Palm Beach include a buoyant public space off the coast of the city’s Currie Park, conceived by architecture office Carlo Ratti Associati. A new wing for the city’s Norton Museum, designed by Foster + Partners, is currently under construction. You can also spend your vacation by fishing. Just have some fishing equipments, a small kayak or boat, trolling motor and battery and go to a lake to enjoy your time. The post Ecosistema Urbano envisions bioclimatic domes for West Palm Beach appeared first on Dezeen.